If you’re a lover of all things beautiful, then it’s time to bring something new to the table and visit some of the most beautiful gardens in Asia. These are true masterpieces of amazing architecture, peace, and unique decorations. 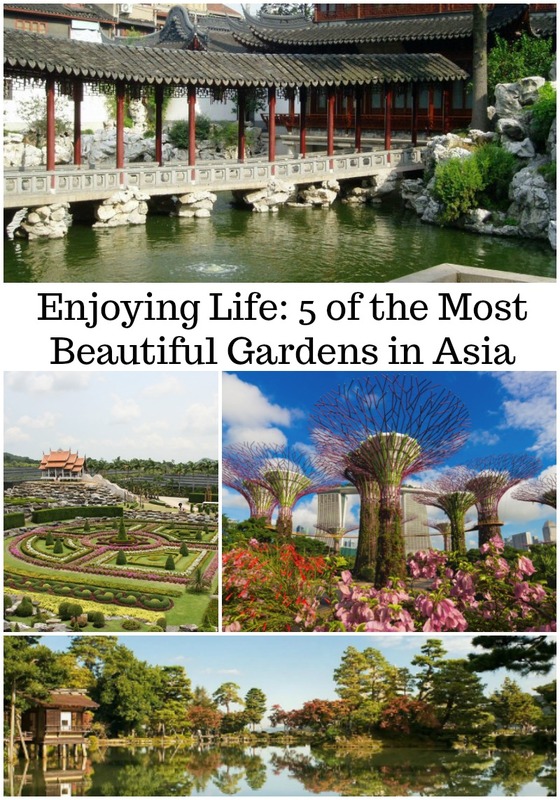 So enjoying life to the fullest must mean putting these gardens on your bucket list. Japan is renowned for its traditional values and love for precision as well as delicate beauty, so that’s what you’re going to see at all of its Three Great Gardens. So although it’s been a tough choice, the number one prize goes to Kenrokuen Garden, a real gem that awaits to be visited throughout the year. That’s one of the main reasons why this garden wins the first prize: it doesn’t just amaze visitors during springtime, but all throughout the year. And it’s not just a regular pretty and neat garden. Its beauty actually careens in magic when you visit it during the winter which sees the pine trees covered in white, along with everything else here. So be sure to get an awesome portable battery for the trip because you’ll get plenty of chances to make amazing photos. Just imagine drinking a delicious Japanese sake in a teahouse near the crystal clear lake and admiring the spring flowers along with the pink cherry blossoms, or the vibrant colors of the leaves in autumn. This is another garden that shows you what Mother Nature has in store for us in terms of delicate beauty, and I love that it has a tropical theme. Besides, it has an eclectic scenery, bringing together various species of flowers from both the Eastern and the Western world. But this mixture is in no way a kitsch, it actually connects two worlds under the auspices of splendor. And each garden here has a different theme, so you’ll feel transported to another place and time almost immediately. Take the French Garden that will take you back to the time of the Sun King, Louie the Fourteenth almost immediately, since it resembles the Gardens of Versailles so well. And don’t forget the Stonehenge replica that’s bound to fill you with a sense of mysticism and closeness to nature. There’s also the butterfly hill, amazingly crafted to remind us about the flower’s best friends, the delicate butterflies. All these carefully landscaped gardens are crossed by a skywalk, so you can actually admire them from above too, for some extra awe, if you felt that lacking. The third medalist can be found in the ancient city of Shanghai, bursting with the Eastern charm of this country. Located in the Old Town part of Shanghai, you can also delight yourself in the architecture of the place, that’s been preserved almost to perfection for hundreds of years. This oasis of tranquility has seen its birth four centuries ago during the Ming Dynasty, a famous Chinese family of Emperors who valued peace and stability more than anything else. So no wonder the Emperor Jia Jin spent two decades crafting this magnificent garden which they named “The Garden of Peace and Comfort” or Yu Yuan. There are plenty of heart-pumping views to delight yourself with, like the Great Rockery which you can climb for a push of adrenaline. This is made out of thousands of tons of stones that are very hard to find. They are yellow, and they stick together with a glue made of rice, so you know they’ll hold. But that’s not the only thing that’s completely out of the ordinary. Take the Exquisite Jade Rock for instance. This mammoth weighs 5 tons, and it’s a slab brought by an emperor from Lake Tai that’s supposed to look like an actual mountain inside the garden. The good news is that it absolutely does. There are few gardens on this Earth as beautiful as this one in Singapore, which bursts with awe-inspiring sights. The climate and geographical position of Singapore also helps in that department, but the crafting of this garden is really ingenious, showing attention to detail as well as a love for natural beauty. Take the Flower Dome, which is a huge greenhouse made entirely out of glass, and in fact the biggest such greenhouse on Earth. And you can imagine how many flowers it shelters here, in the most vibrant colors available, placed next to each other so you don’t know what to admire first. The royal orchids might look the best from the lot though. There are a couple of lakes too that will give you the chance of a quiet stroll while you admire the nearby plants and trees. But the Cloud Forest might be the star attraction of the place, a dome that provides a home to a mini-rainforest and some mountains. There are lots of rare species of flowers to gawk at here, and the whole thing is covered in mist for an extra plus of magic. Another imperial garden located at the Taj Mahal, the postcard beauty of this Garden is only surpassed by its inspirational story, as it was built by an Emperor who loved his wife more than anything in the world. Don’t forget to bring some odor-proof bags for your food, you’ll spend a lot of time walking through this garden and you’ll want to enjoy the flower’s delicate fragrance. The Persian architecture, with its intriguing design and symbolism with references to paradise and the zodiac, are bound to keep you hostage for hours. Walking through these paths will take you back to time immemorial and you can enjoy vibrantly colored flowers and amazing trees. Even if you get here during the Monsoon, you can still enjoy the surrounding areas and the spectacular gardens. With so many wonderful and inspiring gardens to choose from, I’m curious where you’ll go. What other great gardens have you visited so far? Share with us in the comments below!